/Image Related /Other General Questions /How can I completely uninstall and then reinstall TinyTake for Windows desktop? 1. Close TinyTake and make sure that TinyTake is no longer running. 2. 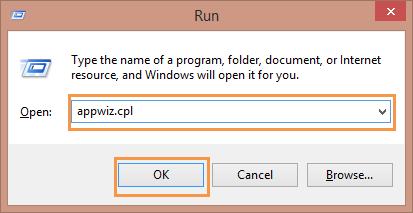 On your keyboard, press the Windows and R keys to open the Run dialog. 3. Type appwiz.cpl and click OK.
4. Right-click TinyTake by MangoApps that appears in the list and select Remove or Uninstall.